2006 Yamaha Black Max. Picture credits - Yamaha. Submit more pictures. 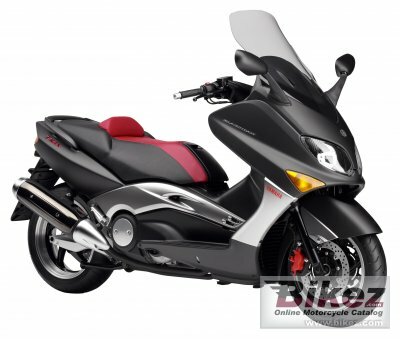 Black Max is a brand-new and highly sought after version of the stunning TMAX maxi scooter. Black Max features all the TMAX�s impressive engine and chassis qualities � powerful fuel-injected 499cc four-stroke motor with fully automatic transmission for genuinely surprising performance and sturdy diamond frame for sports-standard handling � plus a whole range of special styling features that make this maxi-scooter stand out from the crowd. Ask questions Join the 06 Yamaha Black Max discussion group or the general Yamaha discussion group. Get a list of related motorbikes before you buy this Yamaha. Inspect technical data. Look at photos. Read the riders' comments at the bike's discussion group. And check out the bike's reliability, repair costs, etc. Show any 2006 Yamaha Black Max for sale on our Bikez.biz Motorcycle Classifieds. You can also sign up for e-mail notification when such bikes are advertised in the future. And advertise your old MC for sale. Our efficient ads are free. You are also welcome to read and submit motorcycle reviews.